I need your help! "AdventureQuest: GUARDIANS" is up for the official name of our mobile, fantasy, 2D role playing game. Does it strike you in the heart as the right name? It certainly fits the game's main storyline. As you have surely noticed, we have gone back and forth a dozen times on the name for this game... calling it everything from AdventureQuest: BATTLEON to AdventureQuest 2 to AdventureQuest Mobile. After personally using those names for the past few months, I can honestly say it has been confusing. This game needs a unique name that is both special to our community, and has broad appeal to people who have never seen our games yet. "GUARDIANS" is the most meaningful considering the game's main story. Unlike our previous mobile games-- BattleGems and Dragons... this is a full blown real RPG. For lack of better words, it is a re-imagining of the original AdventureQuest with an advanced and flexible combat system. If you are one of many players who have stopped using PCs completely (I know, to us PC users this sounds crazy, but you would not believe the %'s of players who only play on their mobile devices now) then yes, this is the game you have been anxiously waiting for. If this is the name we go with, it would make sense to allow you to login to both the original AQ and AQW from the game to unlock story driven content from your... uh.. "ancestor." Please help make this decision. We are "sleeping on it" tonight. If you feel this is right name for the game... go to the official FaceBook post on this and write "GUARDIANS!" in the comments box below. If you have another name that you are 100% sure is better write it! Like most decisions... there are often multiple good answers. I am sorta terrible at making decisions on things like this which is why I always come to you. Thank you in advance for being a part of the video game making process. This Friday, battle to save the Seraphic Paladins from the treason, betrayal, and murder lurking in the shadows of their Fortress! Aid Darkon, commander of the Order, as you seek out spies sent by the Undead Legion, then help purge the Order of Dage’s dark influence. Become a bone-ified commander of the Undead this Friday with Dage’s Obsidia Necromancer! 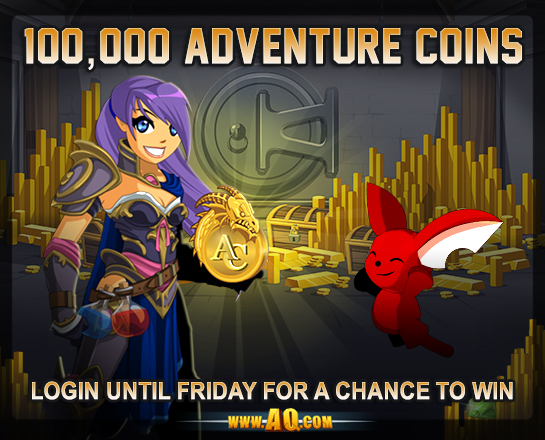 Unlock the entire set with a 12000 AdventureCoin package, including the color-custom armor and helm, or find select items from the set in a limited-time rares shop in-game! After a long period of relative peace, war has finally reached The Wasteland. Join the Legion or Exiles to battle for dominance of The Wasteland. Attackers will use Drone Launchers to loot The Lawman’s secret Ammo Cache. Defenders will use Sabotage Kits to thwart the attackers. The evil To Pan steals Floyd’s bride-to-be as part of a ritual to grant him immortality. Now you must sail with Floyd to the island of Syna to get her back! Also don’t miss Aquardiche coming to the Limited-Time Shop and the Dardebil player face in Warlic’s shop. Log in this week and continue Roirr's story! Play as the villain himself and make your way through the silvered woods of the western continent to find the Ull village. The Aegis is back! You can find the new version, as a Star Captain Exclusive Mecha, with brand new specials in the Star Captain Armory tonight! New icons! After many of you suggested that the weapon type icons needed an update we are! You’ll be able to tell what weapon type is being used much easier now! Earth Day was Wednesday! You can still pick up a shoulder weapon to celebrate! Titan, Nightwraith, Charfade and Rabblefroth have been secretly developing a new mobile game entitled “BioBeasts” while also working on EpicDuel (woah, they must drink A LOT of coffee!). Today we’re excited to showcase the progress the EpicDuel team has made so far! BioBeasts will be a free, single-player arcade-survival game for mobile devices (Android and iOS) where you control a mutating beast fighting to escape from a robot-controlled laboratory. You will control a variety of beasts as they try to escape from a lab run by the sadistic Alydriah. Defend yourself against a horde of robot guards, laboratory defenses, and hulking bosses as you claw, bite, blast, and bash your way to freedom! Unlock new beasts with special powers and obtain potent mutations to experiment with as the game progresses. The team is already well into development and have a number of screenshots posted on their shiny new website: BioBeasts.Artix.com! Check it out and peruse the BioBeasts FAQ. Be sure to post your questions and suggestions on the new site! The team will respond to your questions in a post on Friday (April 17). You can also follow all the exciting new announcements for BioBeasts on Twitter, Facebook, and Google+. This Friday battle to save the healers of Feverfew Falls! The Firestorm Onslaught has attacked, the temple has been destroyed, and many of the refugees and the sick have been taken... but WHY?! Discover Tyndarius’ fiendish plans for the kidnapped children, then fight your way out of the temple to rescue them before YOU become the next to fall! Restock of all Limited-Quantity items! The Chaos Plague is Spreading! Who else will be Infected? Neron has been hard at work studying the blood samples that you collected while on patrol, but he needs your help to get a closer look at the werewolf infection as it spreads! Log in now to get started on Bloodwork! A strange object has crashed! Sys-Zero needs your help to find out what it is!